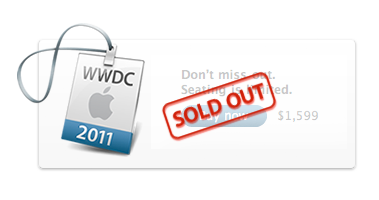 WWDC 2011 tickets were sold out in less than 10 hours. That’s a lot faster than WWDC 2009‘s 2 weeks and WWDC 2010‘s few days. WWDC 2011 will begin June 6 and end on June 10. With over 100 technical sessions for the Mac, iPhone and iPad. This year Apple promise to unveil the future of iOS and Mac OS. Registration costs $1,599.